We’re really making solid progress out at the RAID camp. The carpenters finished up their work to raise the camp structures, they have a water system up and running, and the drillers have been experimenting already with different approaches to augering through the firn zone. Now that camp is functioning as planned, it’s time to move people in and out. In the US Antarctic Program, as elsewhere, passengers in the aircraft system are referred to by the shorthand, ‘pax’. As we transition from construction to operation, the pax come and go. Carpenters have been pulled out, and the members of the traverse team not involved in testing have pulled back to McMurdo. Yesterday, the four remaining drillers made it out to camp during a spell of good weather. Their helicopter launch was picture-perfect with clear skies and calm conditions. Unfortunately, the rest of us on the science team are scheduled to fly out by helicopter today, but the weather changed suddenly overnight. This morning we woke to light blowing snow, overcast skies, and poor visibility over the sea-ice which the helo pilots have to cross on their way to Minna Bluff. Here weather rules everything. If there’s a low ceiling, poor surface definition, or poor horizon, that’s no-go for helicopters. So for now we are on a weather delay and cool our heels until we hear that we’re back on for a launch time. Amazingly, we have wifi internet at the RAID camp by virtue of a connection to a signal repeater! So we are able to get daily reports from Chris, the lead driller, about their progress. One of the unknowns at Minna Bluff is the snow accumulation rate, which, along with average temperature, dictates how thick the firn will be. 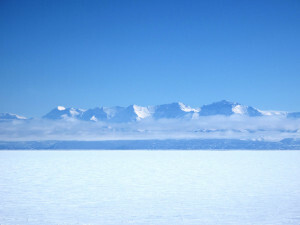 Firn is the compacted snow that progressively recrystallizes into solid ice as it is covered deeper and deeper below the surface with new snow above. Because the firn is still permeable – imagine styrofoam with lots of open spaces — we need to insert casing pipe through the firn and seal it against the non-permeable solid ice below. That way, our drilling fluid will be contained and not leak into the firn. We only have a rough estimate of how thick the firn will be, so this is the first of many experiments we have to run in the face of many unknowns. Chris has been experimenting with different approaches to augering through the firn, which also means clearing the cuttings from down the hole. I imagine that this is among the first of many challenges that lie ahead and will require on-the-fly trouble-shooting. But dealing with unknowns and surprises is a drillers’ way of life, and Chris is more than ready for the challenge. In meantime, with our preparations completed here in McMurdo, we have an opportunity to take in some of the many unusual and impressive sights around town. Just a short hike around the base of Observation Hill will take you past the helo pad and across a slope from which you can see the Royal Society Range of the Transantarctic Mountains in the distance, Mt Discovery, a dormant volcano, and Weddell seals who have hauled out onto the sea ice to bask in the all-to-brief summer sunshine. Plenty of incredible sights! 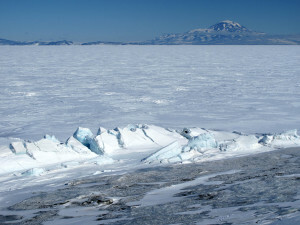 A view across the sea ice from the flank of Ross Island toward Mt Discovery, a dormant volcano. The pressure ridges form here along the shoreline due to a combination of wind and tides. The Royal Society Range with tendrils of low cloud. Is there a better name? 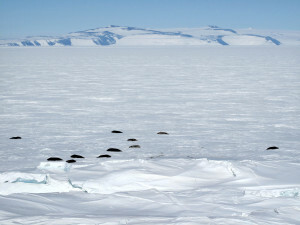 Weddell seals basking in the midday sun, with White Island in the background. 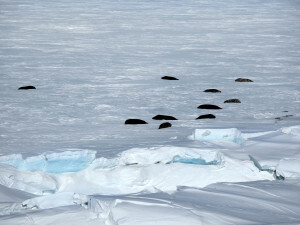 Closer view of seals on the ice behind some pressure ridges. They come up through ‘leads’ in the ice when they’re not feeding. 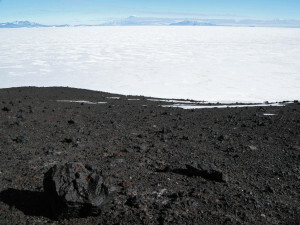 Black volcanic rocks on the flank of Ross Island form a ‘moonscape’ of large relics set in a desert pavement formed by wind ablation. Eruption of lavas like these formed the volcanic features in the distance. 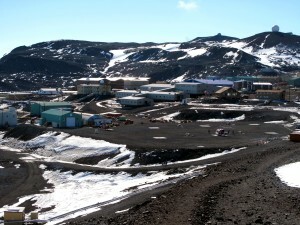 Overview of McMurdo Station, with the helo pad in the foreground and the main center of ‘town’ where most of the activity occurs, mostly hidden from view.